Posted September 20, 2014 by Malcolm Stewart & filed under Episodes. Question. 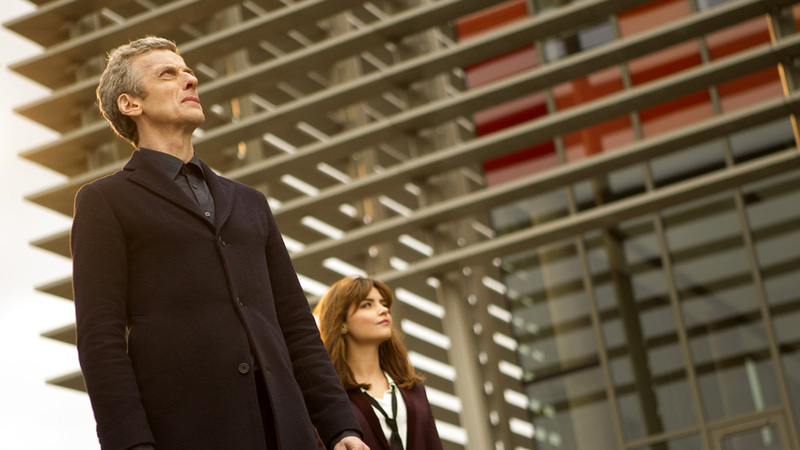 If Doctor Who has such a flexible format, why does it revisit its own ideas so often? Conjecture. Because ideas breed ideas – just not necessarily new ones. For the bulk of its running time, ‘Time Heist’ plays – as it intends to – like a sassy, spacey variation on the heist thriller. However, there’s no getting away from it. The story’s dénouement, in which the Doctor willingly sacrifices his memories to the Teller, and the Teller is revealed to be a monster motivated by the love of a missing partner, brings back strong memories of last season’s ‘Hide’ and ‘The Rings of Akhaten’. Memories which – in the absence of our own memory worm – we have been unable to wipe. It may seem curmudgeonly to criticise ‘Time Heist’ for its familiar-feeling final act, just as it may seem perverse to start with its ending. But then – starting with the ending is very much in the spirit of this time-hopping adventure, which, like Eric Morecambe, seeks to play all the right notes – but not necessarily in the right order. The Doctor sums it up when explaining how The Architect managed to get the suitcases into the bank for him to open: ‘By breaking into the bank in advance of breaking into the bank.’ We are caught in a typical Moffat loop where effect precedes cause. But truthfully, the plot is less tricksy than it appears to be, happily riffing off the clichés of the heist movie genre and prefiguring its own revelations with solid sure-footedness. Where there is genuine finesse, it comes from the eye of director, Douglas Mackinnon. As is becoming the pattern this series, the jump-cut flashback is the order of the day, both as comic punctuation – such as when Clara remembers Danny talking Yoda-stylee about their forthcoming date – or to clarify the twists of the narrative. Cross-fades propel the story and imply concurrent action, and there are two effectively stylised slow-motion sequences, when the Doctor and his gang walk into the bank, and – better still – the first appearance of the Teller, who is led into shot, like the Sheriff coming into town, accompanied by an appropriately Ennio Morricone-style score. For many viewers, it will be the Ocean’s Eleven franchise that most comes to mind when watching ‘Time Heist’, but for this particular viewer at least, it felt most like a live-action version of a 1980s’ Marvel Doctor Who comic strip. It wasn’t just the cameo of Abslom Daak, Dalek Killer (the only would-be bank robber to have his image captured by a court artist), more the feeling of a Star Wars-inspired world of grotesque capitalists. Had – *obscure reference alert* – Mr Dogbolter been revealed as villain, or even his televisual equivalent, Sil, it wouldn’t have come as a surprise. So much here owes a debt to the archness and blousiness of the 1980s: Clara dressed fetchingly as the Blues Brothers’ sexier younger sister, the obsession with and simultaneous disgust of filthy lucre, and, above all else, Keeley Hawes’ performance as Ms Delphox, who is quite del fox, dressed in oversized glasses and with hair like a croissant yearning to be a shell. Does Hawes bring to this the electric ambiguity she gave to Line of Duty’s Lindsay Denton? Not in the least. But it’s a different audience – and in fairness, it’s difficult for her to avoid campiness when Delphox/Karabraxos refers to herself as ‘moi’ or shows a Norma Desmond fixation with getting people ready for their close-ups. A rather more successful villain is the Teller, who, straitjacketed in an orange spacesuit, is a glorious creation: simultaneously chilling and pathetic – even if his modus operandi does bring to mind ‘The God Complex’s Minotaur. 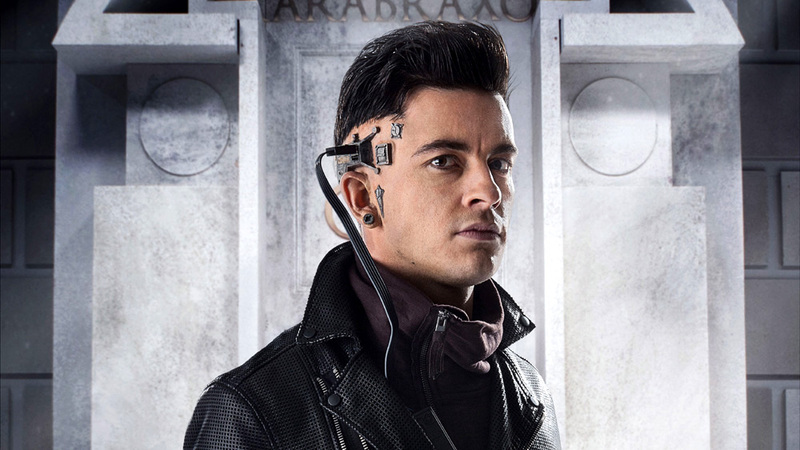 He’s rather less convincing when seen in his naked form at the end of the episode, and in fact it’s questionable why this scene is included, when the scene we needed – the scene that is notable by its absence – is the one where Psi is reunited with his newly-remembered loved ones. The script goes to some trouble to give Psi and Saibra their X-Men-esque distinguishing quirks, but without a proper emotional pay-off for the former, he feels too much like a generic companion, there to prompt the Doctor with questions about the plot and to show appropriate contempt at the Doctor’s callousness. This may be the trouble with such relentlessly twist-driven, time travel adventures: the need for exposition overrides the need for emotional truth. It’s certainly the case here, where for every glorious one-liner in Thompson and Moffat’s script (‘We’re getting sanity judgement from the self-burner?’), there’s a dialogue clunker that self-consciously shifts the narrative up or down a gear. Certainly, now might be the time to tone down the Malcolm Tucker in the Doctor’s characterisation. Having the Doctor bark ‘Shut up! 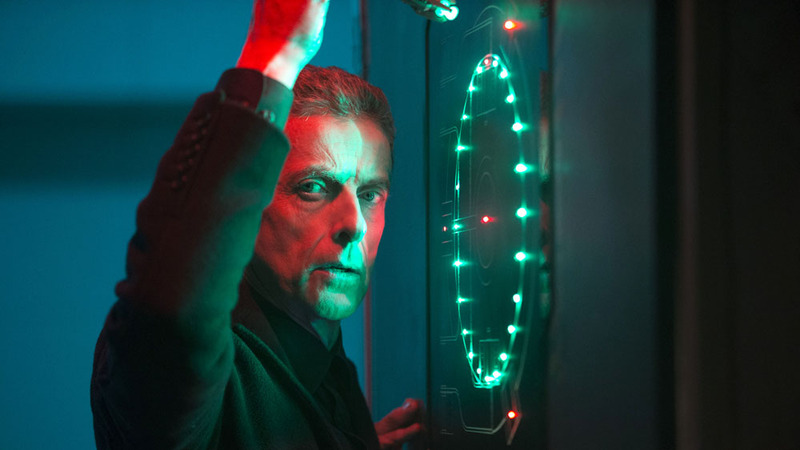 Shutity up up up!’ is a joke that will clearly be received differently by children, who will revel only in the Doctor’s word-twisty rudeness, but for adults, the shadow of Malcolm still looms too large over Capaldi’s Doctor. Ironic self-knowingness is all very well, but in an adventure such as this – which is, at heart, as traditional as any adventure with multiple ventilation shafts must be – there’s something to be said, at times, for playing it straight. Aired at 7.30pm on Saturday 20 September 2014 on BBC One. Okay ep, nothing special, a bit heavy on the cheesy ending/reason for the heist. There has been a lot of cheese in this season so far. Shouldn’t surprise me there was a lot of cheese in the first two episodes of Sherlock season 3 and I see the same writers involved here. The episodes I have preferred have been the Moffat solo ones just like The Season 3 Sherlock finale The Last Vow. But even then I don’t think the Moffat ones are up to his past standards. I always looked forward to the Moffat ones especially in the 9th and 10th doctors eps. But now its all a little to pat, and nice and correct and nice happy endings with no consequences and everyone coming back from the dead and everything can be fixed. And to top it all off a bunch of damp suib baddies who’s only talent is boring you to death. I mean, the motivation was well enough, but yeah. The overall execution of the story’s end was very reminiscent of “New Earth” from season 2 or “Love and Monsters” in its overall forgetfulness as an episode. Meh, every season has a lemon. Lets hope this one just got that out of the way early. In my opinion this is one of the best ones so far this series, the pace never relented without becoming too clever for it’s own good, the ideas, though many, clicked together nicely and were given breathing room, and it was an artistic spectacle! Agree my Ood friend. This was a really neatly executed episode which didn’t try to be too clever and used the time travelling concept well – not too convoluted. I also liked that the pacing was spot on and that the secondary characters all had distinct personalities – something which can’t be said for ahem Journey to the Centre of the Tardis. What really made this shine though was another top notch performance from Capaldi. His little Malcolm Tucker light line gave me the giggles and I love his banter with Jenna. There were also a couple of sly nods to previous episodes which was fine here as it didn’t distract from the overall concept which had its own originality. Being able to do this, shows how confidently the show is in its stride. Although I have a fondness for Into the Dalek for its sheer visceral power, this might now be my second favourite of the current run and certainly leagues above any of Stephen Thompson’s previous episodes. Perhaps the magic of ‘those eyebrows’ in action? Next week looks great too. The Lodger would certainly fall within my handful of favourite ever Who episodes and when Gareth Roberts really gets it right, like he did with that episode, he is as good as anyone else writing for Who whose initials are not SM. Mind you, when he really gets it wrong, you could end up with Shakespeare Code. Hope that magic eyebrows have worked their mojo on next week’s instalment. Perfect, breezy Who. Filled the 45 minutes without waste or padding and we got a set of well acted and interesting secondary characters to boot.Peter was on top of his game again and nice to see him take charge. You could just tell where Steven Moffat’s expert touch helped elevate this from a competent but forgettable episode to a really great one. That’s five in a row for me which I have loved. Ooh next week is the big comedy one. The Doctor and Danny finally get to meet. Sounds like Clara will have her work cut out! Gareth Roberts can be a bit hit and miss but hopefully more like The Lodger and Closing Time and less like Shakespeare Code and Planet of the Dead. I thought it played like a fun little episode. Considering that the two walk on assistants both got something logical for their situations; I felt emotionally robbed by one thing. What was the Doctor truly in it for? I DVRed the episode, so I can watch it again. However, I felt robbed because I thought we were going to learn something about him. Nada. For me the best in this series so far, it moved along at a good pace and I didn’t get fidgety which I did partcularly during the first episode of this season. Great episode which combined the best of new and old Who for me. Capaldi was sensationally good again. He is so brilliant and such a massive improvement on Chinny and Sandshoes that I wonder what new heights he can scale in this performance. The plot was absolutely watertight and the secondary characters all had distinct personalities. 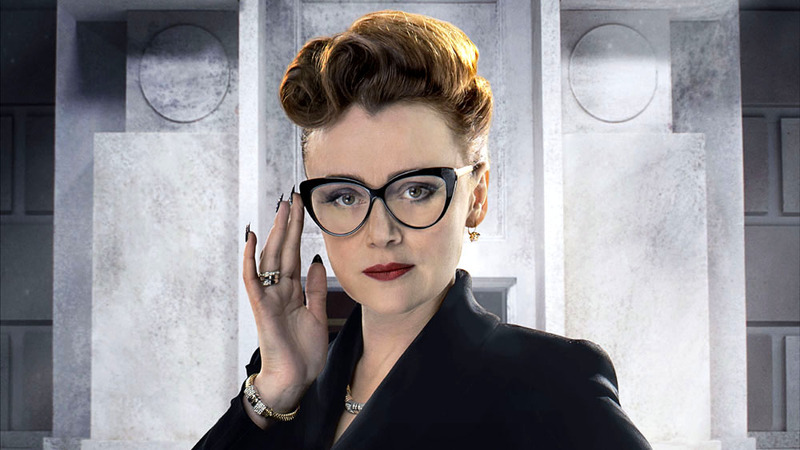 Keeley Hawes made for a superb villainess – the best by far of the generic RTD women in suits over recent years. Clara looked super cute. Plus one of the best new creatures we have seen. Nine out of ten for me and only behind the superlatively great Listen as best of the series so far. I want to know where I can get those glasses! 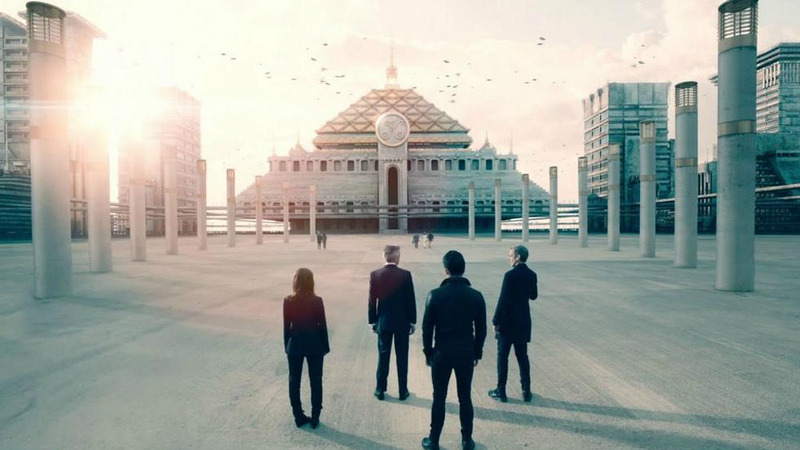 You can tell where Moffat got his idea to influence Under the Lake/Before the Flood and Heaven Sent. The whole second heist is pointless, as the Doctor was able to enter the Bank once, completely undetected. Even if the Teller had read the Doctors intend, do you really think the Teller would kill the only one person who could save its mate? Why didn’t the Teller turn Ms Delphox’s brain to soup? The Teller knows the PV combination. And, once a brain has sections of its memory erased, is it really possible to have them returned whilst having you’re brain turned to mush? A truly unbelievable episode which would be completely forgettable except I don’t have the luxury of a worm.